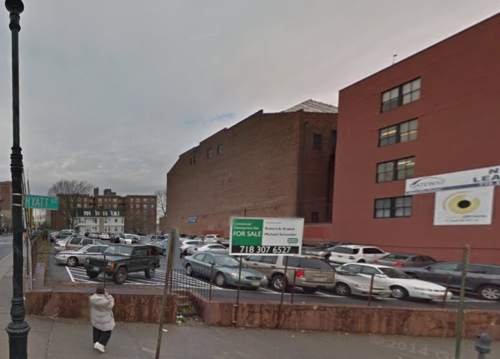 One of tallest new buildings in Staten Island will soon be built in St. George, at the northern tip of the borough, the Staten Island Advance reports. The height? A whopping 15 stories. The property is located at 315-325 St. Mark’s Place and was just sold two weeks ago by owner Hyatt Development LLC for $9.5 million. The 37,000-square-foot site was purchased by a group of “international investors” who plan to build a cute luxury residential building with “360-degree panoramic views of Manhattan” (which is, unfortunately, impossible). “This will be a high-end, Manhattan, Downtown Brooklyn, shiny building,” says Michael Schneider of Schneider Realty, who brokered the deal. The adorable little building—right at the cusp of adulthood—could eventually hold 140 to 180 units, with parking and commercial space on the lower levels. According to the Advance, the Castleton Park Apartments at 185 and 165 St. Mark’s Place are likely the tallest buildings in the borough, at 20 stories.